In recent years, there has been a remarkable resurgence of interest in classical conceptions of what it means for human beings to lead a good life. Although the primary focus of the return to classical thought has been Aristotle's account of virtue, the ethics of Aquinas has also received much attention. Our understanding of the integrity of Aquinas's thought has clearly benefitted from the recovery of the ethics of virtue. Understood from either a natural or supernatural perspective, the good life according to Aquinas involves the exercise not just of the moral virtures, but also of the intellectual virtues. Following Aristotle, Aquinas divides the intellectual virtues into the practical, which have either doing (prudence) or making (art) as an end, and the theoretical or speculative, which are ordered to knowing for its own sake (understanding, knowledge, and wisdom). 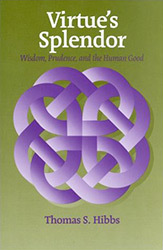 One of the intellectual virtues, namely, prudence has received much recent attention. With few exceptions, however, contemporary discussions of Aquinas ignore the complex and nuanced relationships among, and comparisions between, the different sorts of intellectual virtue. Even more striking is the genreal neglect of the speculative, intellectual virtues and the role of comtemplation in the good life. In Virtue's Splendor Professor Hibbs seeks to overcome this neglect, approaching the ethical thought of Thomas Aquinas in terms of the great debate of antiquity and the Middle Ages concerning the rivalry between the active and the contemplative lives, between prudence and wisdom as virtues perfective of human nature. In doing so, he puts before the reader the breadth of Aquinas's vision of the good life.